After a couple of discussions about my first #windsorgone blog, (you can find it here) I decided to change the topic of the second blog from what can be done locally to the following discussion. Be warned there is some data analysis and numbers in the post. An “omission” from my first blog of my discussion on the Windsor Gone series was the fact that I didn’t mention nor did I really engage the issue of young people leaving Windsor-Essex. This was a deliberate choice on my part, as young people leaving Windsor-Essex is the symptom of broader structural problems facing the region (some of which I discussed in Part 1 as well as in my question to the #WorkWindsor Forum) rather than a problem on its own. One thing that needs to be pointed out is that young people leaving Windsor is not necessarily a bad thing. If there are no opportunities for people (young or old) in an area they move on. This is how it has always been in free societies; in the good times people come to a city and in the bad they leave. In the 1950s, ’60s and ’70s when Windsor was Canada’s automotive capital we drew young people in from a across the country but times change and now they are leaving. Looking at the data that accompanied the Windsor Gone Series, the headline of over 30,000 young people fleeing our city (the actual number in the data is 35,101 excluding 2013 projections) makes it seems like a mass exodus is occurring. Although the headline is accurate, it only tells part of the story. The data used in calculating the announced number was based on inter- and intra-provincial outward bound migration statistics. This means that the data only shows people who left Essex county for somewhere else in Ontario, or to another province. As a result this data doesn’t include other types of migration like international immigration/emigration as well as birth and death rates, which also impact the total population and the number of young people in our region. The data also doesn’t include temporary migration which means that short term residences (like people living in the city or leaving the city for University/College) are not included in the tallies. These omissions, mean that we are not seeing the full picture of what is occurring. For example, inward bound inter- and intra-provincial data clearly shows that over 25,373 youths (Age 15-29) migrated to the Windsor-Essex region over the same time period as the reported exodus. As a result the net loss for our region is 10,671 young people rather than the 30,000 person headline. This number can then be dissected further as it is based on data collected over a 12 year span (2000-2012). What you can see is that Windsor started the millennium actually attracting young people and it wasn’t until 2004-05 did the rate of exodus from the city become concerning. I say that because when the net migration rate was less than 500 people per year, many of those people are individuals who probably would have left no matter the state of the city or economy and they represent such a small fraction of the overall population that the net effect is minimal. Overall all rates of outward migration did not rise to worrying levels until 2005 as the region’s economy began to declined with the collapse of the auto sector. After “bottoming out” in 2009-10 the outward migration rate began to decline but we still see several hundred young people leaving Essex County each year. The other takeaway from the data is that Essex County has lost many more men than women. Whether men are more willing to uproot and leave or if women are being held back in someway is unclear. This difference in gender in the outbound migration data could relate to how single female parents in Windsor are 4X more likely to be living in poverty than an average family. The data that was used in Windsor Gone certainly is impactful but flawed to a certain degree. Not only does it not include certain types of migrations, the definition of youth also causes some concern. Windsor Gone uses the age range of 15-29 to define youth, unfortunately there are dozens of other definitions of what age range defines “Youth”. From my point of view, including anyone under the age of 18 in migration data is problematic as very few 15-17 years olds move from a community of their on their own accord. If a 15 year old is moving it is likely because their family is moving, so to count them in a discussion of economic migration of young people is flawed. A similar argument could be made for 18-23 year olds. Following graduating high school, some people enter the workforce but many more move onto post-secondary education, either locally or in another community. Those in post secondary education generally do not have full-time employment nor have they entered their chosen field of employment. After they graduate many cast a wide net with some leaving the area for jobs and others coming to Windsor-Essex for work. For many 18-23 year olds, their efforts to find full time permanent employment does not truly begin until reaching the age 24. In my mind, the 24-35 year old range is a more important group of people of whom to track migration. I make this statement because young people between the age of 24-35 are not only highly mobile but are also those who are starting their careers and preparing to set down roots. This age group hold the average age of marriage for both males and females at 31.1 and 29.1 years respectively, which was missing from the original data set. Marriage can help anchor young couple to a community as in many cases, some form of financial/job security is a prerequisite before spending the 2014 average of $31,000 on a wedding. Unfortunately for Windsor, the trend for this age group mirrors the primary Windsor Gone data. Between 2000-2012, 11,278 young people (aged 24-35) left Windsor-Essex, 607 more people than in the 15-29 age group. Although this number is only marginally higher than the reported youth migrations numbers, these numbers represent individuals who, are not moving because of their parents and they have, generally speaking, completed the period of time when most young people attain their post secondary education. The result is not only a loss of young people but a loss of people at the prime working age and when they are most likely looking to set down roots in a community. I see three important takeaways from the data. First, some young people “just can’t wait” to get out of Windsor-Essex. Although I don’t consider myself one of them I can certainly understand it; living in Toronto, Vancouver, Chicago or New York brings a level of excitement that the City of Roses could never match. There will always be an outward bound group of young people who leave for a job, college or university and never comeback. That being said, just because young people leave doesn’t always mean that they don’t come back. Windsor Gone highlights a number of examples of individuals and couples who have moved into the city after leaving. I myself went from Tillsonburg, Ont. to Waterloo, Ont., back to Tillsonburg, then to Windsor, and then to Vancouver, B.C. before coming back to Windsor. 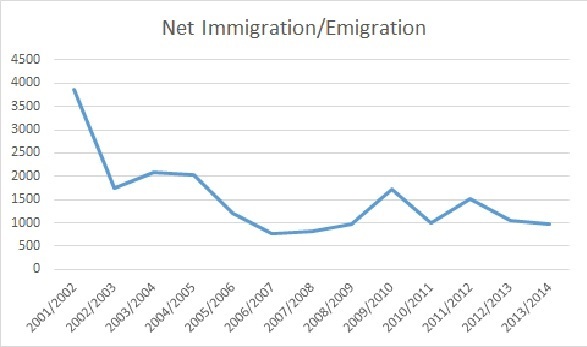 Looking back at the data there is no way to know if some of 1,000 people who left in 2005 weren’t the same people who returned in 2010 or 2012.
immigration/emigration data from Essex County shows that since 2004 our region has attracted an average of 1,200 people per year (this number would be higher if you include pre-2004 data shown on the graph) from outside of Canada. Although I didn’t breakdown the age/gender specifics of this data this positive immigration partially off-sets the outward trend in young people from our area. Finally, hundreds of communities across the country are losings people to big cities, not just Windsor. Toronto recently passed 6 million people, and other cities across the country are also growing at rates that far outstrip small and medium sized communities and regions like our own. That population growth is coming from somewhere and some of it is coming from here. As I mentioned in my #Workwindsor question part of the challenge that we face comes from the fact that we have thousands of young people enrolled in University for degrees that our local economy can not support. Let me use myself as an example: the job prospects for someone who has two Master’s degrees (in Political Science and Public Policy) aren’t that great in Windsor-Essex. I don’t regret staying in Windsor for a minute, but I have experienced the challenges of finding work (described in a blog post I wrote for YKNOT here). Due to my choice of educational background and the limited job prospects in my field (public policy and economics) I saw many of my friends and classmates leave the city go to Ottawa or Toronto for work with the Federal and Provincial government while others went to Law School or chose to pursue a PhD. A few colleagues (including myself) were lucky getting positions in local government or not-for-profits but often in positions that didn’t exactly match their educational background. This same story can be applied to hundreds of new graduates each year. They leave the relatively warm embrace of academia and find a scary local job market where only certain career paths provide immediate opportunities locally. How is it not surprising that young people leave the city? Part 3 of this blog series will be about what can be done locally to keep young people around. ← My Thoughts on #WindsorGone Part 3 – What can we do?